Can Microneedling Really Help You Get Younger-Looking Skin? Chances are, you’ve experienced your fair share of breakouts — you might even have the scars to prove it. Couple that with the appearance of wrinkles as you get older (we know, not fair! ), and you may find yourself looking for a treatment that tackles both of these skin issues. Enter microneedling. Can sticking tons of tiny needles in your face really help make your skin look better? The procedure sounds scary, but its name is way more intimidating than need be. Also known as collagen induction therapy, microneedling is a non-surgical procedure that can shrink the size of your pores, wrinkles, and acne scars and treat dark spots, stretch marks, and uneven skin tone. 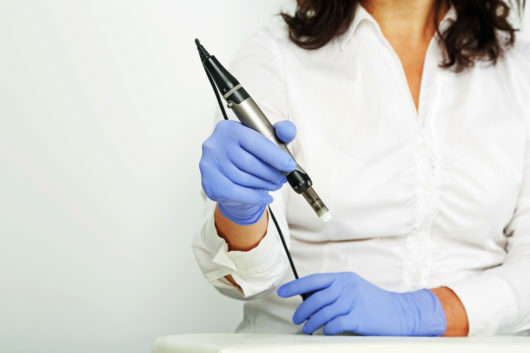 Microneedling can be performed on the face, neck, chest, arms, hands, legs, stomach, and back. 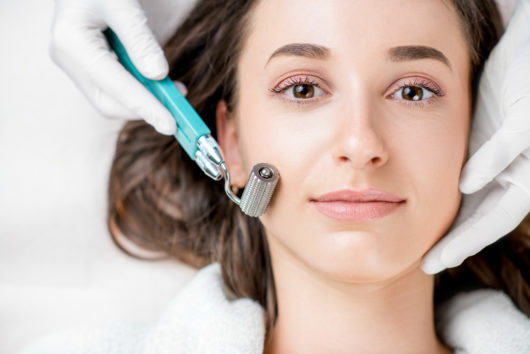 While there’s no downtime, microneedling isn’t exactly a walk in the park, and can definitely cause some pain depending where on the body it’s done. During the procedure, your dermatologist or esthetician will use a tool containing lots of teeny-tiny needles to create itty-bitty holes in your skin. This stimulates your skin to create collagen to heal itself. Quick science lesson: Collagen is a protein that’s naturally found in your skin — basically, it’s responsible for how smooth and plump your skin looks. The thing is, your skin starts to naturally lose collagen as you age, which leads to thinner and looser skin. 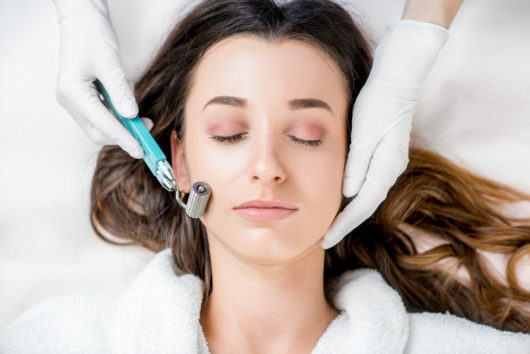 Essentially, microneedling is a noninvasive option for those who might otherwise consider dermal fillers — the tiny needles help boost the body’s own collagen production so your body can fill those scars and wrinkles irself. Microneedling also has another benefit: Those tiny holes it creates in your skin allow skincare products to be better absorbed. That’s why whoever’s performing the procedure will likely apply a potent serum afterwards. What can I really expect during a microneedling session? First things first: Always visit a board-certified dermatologist or licensed esthetician for any sort of skin procedure. Estheticians can perform microneedling procedures but, according to FDA guidelines, they can only use microneedling devices of less than 0.3 mm that do not make medical claims. You should avoid microneedling if you have vitiligo, are prone to keloids (raised scars), currently have an active skin infection like herpes, or have taken oral isotretinoin (a med used for severe acne) in the last six months. Whew, got all that? Let’s move on! Expect to spend anywhere from 30 to 60 minutes at the office for a microneedling treatment. When you arrive, the person performing the microneedling may apply a topical anesthetic to help prevent discomfort, depending on how deep they intend on puncturing your skin. People report that the needle pricks typically feel like sandpaper rubbing against your skin — but it becomes more uncomfortable the deeper the needles are inserted. Once the numbing cream kicks in, your microneedling session will last anywhere from 15-30 minutes, depending on what area you’re having treated. The microneedling device has a high-speed motor, meaning the needle penetration happens lightening fast — hence why you won’t really notice that you’re being pricked with needles. 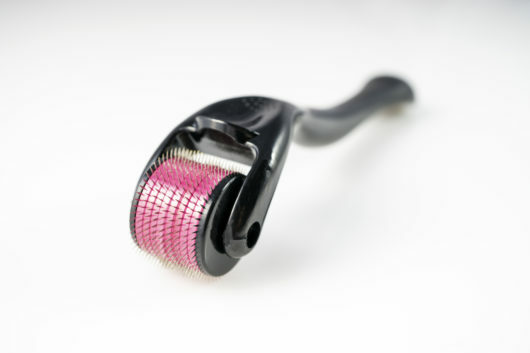 Some devices are derma rollers (like the one pictured above), others are micropens (like the one shown below). Generally speaking, most rollers have needles that reach a depth of 0.25 to 0.50 mm. Micropens can penetrate the skin more deeply, even 1 mm or more, if need be. Although there’s no downtime after microneedling, your skin may look red post-treatment (almost like it’s sunburned) and you may also experience slight swelling and tenderness. If you’ve had deeper needle pricks, you may even notice pinpoint bleeding, but this will usually go away within a couple of days. Whatever shape your skin is in, you can use makeup immediately to cover up any redness. I survived my first microneedling treatment! What happens next? If you have any discomfort after microneedling, you can use cool compresses to ease the pain. It’s also a good idea to be diligent with sun protection (hopefully this is something you’re already doing every day!) and steer clear of using anything abrasive on your skin in the first few days after microneedling. 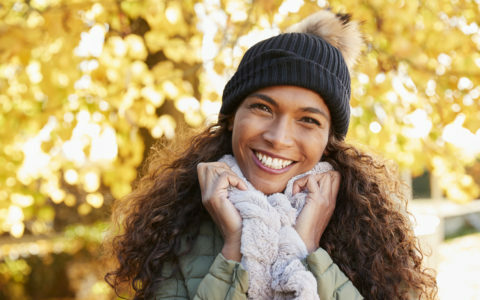 You should start seeing changes in your skin a few days after your treatment, and experts usually recommend scheduling 3-5 microneedling appointments for best results. Just don’t roll the derma roller over active breakouts. It will spread the ance bacteria from one pimple across your face and push it into your healthy skin. Beauty fad of the decade. A few girlfriends had microneedling performed, only to be sorry a year later, because skin on their faces is actually showing tiny little holes. They‘re visible in the sunlight. It‘s really weird. It has happened to 3 friends, and they‘re sorry they got convinced to do the procedure. I have a micro needle pen it’s a little hard for me to do but I have done 2x I definitely noticed a difference and I love it.I’d love to have you do a treatment..what is the cost..and do you have a office near Thousand oaks CA? Should a person with Rosacia avoid microneedling?